Greg Weatherby has been a member of Boomalli since 1997. His achievements are countless such as having completing designs for the Olympic Games Sydney 2000, as well as government and corporate organisations including the Sydney Duty Free shop - airport buses. 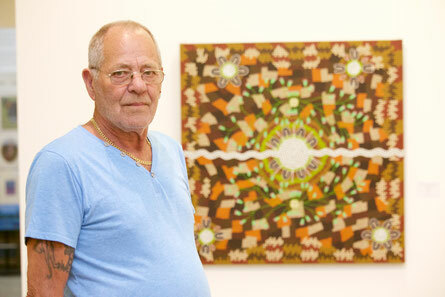 During the past two years, Greg has achieved recognition as a renowned Aboriginal Artist. Greg received the "Premio Speciale Della Critica" Award at the International Festival of Art Awards in San Crispino, Italy in 2015.